APPEARANCE: Black with black highlights beflecked with black. NOSE: Espresso beans, milk chocolate, dark-roasted malt, and a hint of smoke. TASTE: Mostly sweet, well-toasted, caramel malt up front with plenty of chocolate and coffee in the middle. Some sourness and smokiness in the finish. DRINKABILITY: I drank this very shortly after sampling the Left Hand Milk Stout. While the Double Cream Stout is a little more aggressive, I’d say it’s just about as drinkable. Milk Stouts are nice session brews….haven’t really met one I couldn’t drink a half-dozen of. 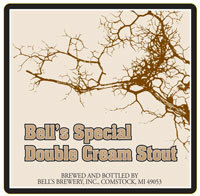 Posted in Tasting Notes.Tagged Bell's, Milk Stout, Special Double Cream Stout, Stout. Agreed, Barley – an outstanding, creamy offering from a terrific brewery. Doc and I tucked into a year old bottle not too long ago and it proved its (probably short-term) cellaring potential as well. Delicious!